The BSA and troop’s goal is to provide the first year scout with a fun and enriching experience so the scout will enjoy his entire scouting tenure and increase his lifelong learning. To accomplish this, our troop follows the national program of First Year First Class. This program presents opportunities and encourages the scout to progress to the rank of First Class during the first year of scouting. The program’s purpose is to ensure that by the end of the first year the scout is “first class” in all the basic scouting skills and ready to participate fully in all activities of the troop, an ideal initially articulated by Baden-Powell, the founder of scouting. When the scout joins the troop he becomes a member of a new scout patrol, which concentrates on the basic skill requirements for earning First Class rank. The patrol may hold special trips and events during the year just for the purpose of working on these items. The jobs within the patrol rotate each month so that each scout gets to experience each job position and responsibility as they learn how the troop operates. Although first year scouts form their own patrols this does not mean they are in any way separate or different from any other patrol in the troop - aside from their common age. First Year scouts camp, meet, plan, and interact like any other scout patrol. During this important first year of scouting, the new scouts are led by the Troop Guide. A Troop Guide is an experienced scout whose job it is to guide the new scouts, creating an environment in which they can learn. He may schedule camping trips, call special meetings, and direct both the instructors and adult leaders toward what the boys need to learn. The Guide reports to the Assistant Scoutmaster for New Scouts and is appointed by and serves with the permission of the Scoutmaster. 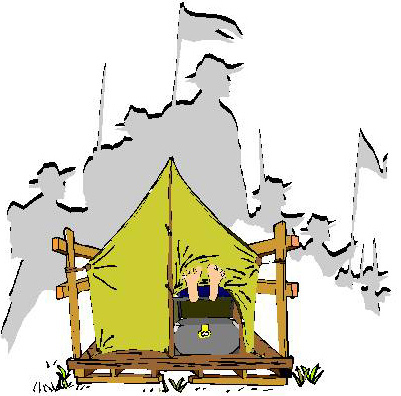 Questions from parents about activities should be directed first to the Troop Guide, who is usually in the best position to answer them. 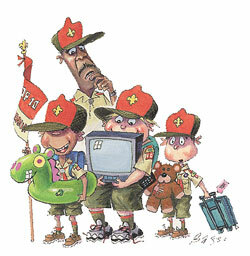 The Troop Guide may also refer parents to the appropriate adult leader. Swimming, so that the scout will be ready for lifesaving and boating merit badges the next year. Nature, so that the scout can explore and understand the exciting and beautiful Summer Camps that our troop goes to great lengths to select. And a handicraft merit badges for fun in the evening and during break periods. The highlight and reward of the first year of Summer Camp is an overnight hike and camp to a remote outpost where the new scouts can practice and celebrate all that they have learned. A successful first year can be measured by how much progress the scout has made towards First Class, with the understanding that each scout is unique and thus, although many scouts will earn First Class in their first year, new scouts may need different lengths of time to complete First Class requirements. First Class in year one is a GOAL, not a requirement. Each patrol in Troop 29 is encouraged to give their patrol a unique name, create their own cheer / yell, and to creat their own patrol flag. Additionally, we offer patrols space on the web to post their patrol information and whatever scout worthy message they may develop. ...and believe me they do! Troop 29 gets its newly minted Boy Scouts from a variety of Cub Packs. And, as there are many different Boy Scout Troops sharing a similar but unique experience to each of their Boy Scouts; so too are there many differing Cub Scout experiences. So, it isn't unusual for Troop 29 to see scouts for 3-4 different packs with differing experiences and activity levels joining us throughout the spring of each year. We are very fortunate to be in the position of receiving scouts from a variety of packs and we want to be certain that we provide the best scouting experience right from the start. This means that no matter where a scout came from we want to see that he is receiving all that scouting promises as soon as he comes in the door. Under the guidance of our Troop Guides our First Year scouts form Patrols that learn teamwork as they share the new experience of Boy Scouts.